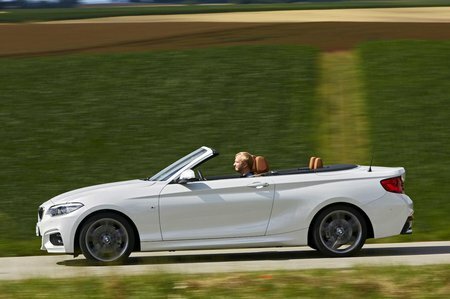 BMW 2 Series Convertible Performance, Engine, Ride, Handling | What Car? The four-cylinder diesel engines have enough performance for most situations. The 220d can reach 62mph from rest in around 7.0sec and is decently punchy at low revs, but even the lower-powered 118d isn’t slow. The range-topping M240i, meanwhile, is seriously fast. The three-cylinder 218i and four-cylinder 220i and 230i petrols lower down the range aren’t sluggish either, but do have to be worked a little harder for a quick turn of pace. BMW's eight-speed automatic gearbox (optional on most models) is excellent. Its shifts are rapid and smooth, and it kicks down a gear exactly when you want it to. The six-speed manual gearbox, on the other hand, is notchy between first and second gears. 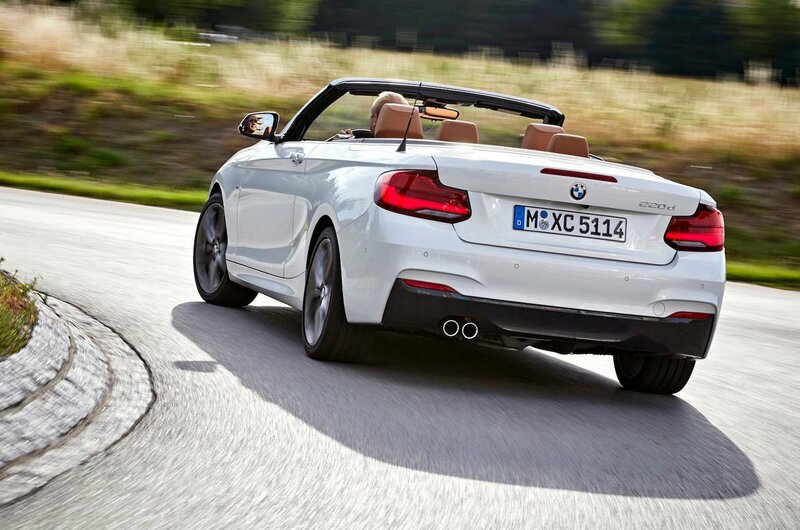 The 2 Series Convertible is a safe and predictable car in terms of handling. If you enter a corner too quickly, the front tyres are more likely to run wide of your chosen line than the car is to snap suddenly sideways and catch you out. That’s not to say it’s boring, because it steers with precision and feels more agile than an Audi A3 Cabriolet, Vauxhall Cascada or open-top VW Beetle. In fact, the M240i version is outright fun with its sportier steering and suspension tune, feeling even keener to turn in and more composed through bends. The 2 Series rides comfortably on the UK’s irregular roads too. In fact, for an open-top, even the sporty M240i, with its larger standard 18in alloy wheels, is surprisingly supple on poor surfaces. BMW’s four-cylinder diesel engines have a good reputation for efficiency, but they're less impressive when it comes to noise. Those fitted to the 2 Series Convertible are no exception. The ones in the 118d and 220d settle down a bit once they are warmed up, but they still cause a din when pushed hard and you feel too much vibration through the wheel and pedals. However, the petrol unit in the M240i is super-smooth and makes a great noise at full throttle, but fades to a discreet hum when cruising. In all 2 Series Convertibles, with the roof down wind protection is good for those in the front seats, if a little more blustery for those in the back. Roof-up, there’s little wind and road noise across the range.